In summer the male birds head and back is shiny black instead of the mottled winter plumage. This photo illustrates the Brambling's white rump with mottled head and back. Also note the dark spots on the birds flank and the striking yellow bill. The female lacks the dark head and back of the male, this photo shows a female in summer plumage, the warm pale orange breast markings are absent in autumn and winter. The female, in common with the male, has a white rump and dark wings. Brambling frequently flock with the more common Chaffinch in winter, the Brambling can be identified by it's distinctive white rump with dark head and back in flight. Breeds in Northern Europe and Scandinavia. Winters in Southern Europe and the UK. A passage migrant in Northern Scotland. Is known to breed in the UK. 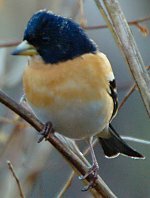 Open woodland and farmland, frequently seen in large winter flocks of other finches feeding on farmland. 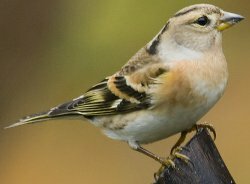 Brambling in the UK are closely associated with the Chaffinch, often seen flocking together in large gatherings on agricultural land. 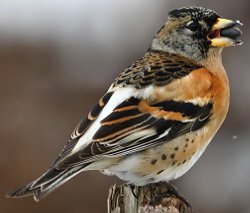 In winter the Brambling is widespread throughout Europe, frequently gathering in flocks of several thousand to feed, however only relatively low numbers visit the UK.